Bug 313300 has been fixed, which means that Firefox 1.5 will not open windows with a specified size as tabs – unlike Firefox 1.5 beta 2 which opened everything in new tabs. Bug 245392 has also been fixed, so Firefox will no more create an empty folder on the Windows programs menu if the user has unchecked the shortcut on startmenu option during installing. I also noticed that Firefox now asks if I want to save my gmail password. At first I thought this was a Firefox fix (or workaround, because Gmail had set it up not to save on purpose) but after hunting around a bit it seems like Gmail have simply removed the autocomplete=”off” attribute that they have used until now. While searching bugzilla.mozilla.org I learnt of a simple way to bypass that attribute, should you come across it at some other site: in about:config, set the wallet.crypto.autocompleteoverride pref to true, and Firefox should simply ignore it. However, I would still advise you to never save passwords for online banks and suchlike if you do turn this pref on. Update 2005-11-04: Having tried the pref I mentioned above, it doesn’t actually seem to do anything. I presume it is no longer used, so as to ensure that people don’t go saving bank passwords, etc. PimpZilla – The Coolest Firefox Theme Ever? PimpZilla must be the coolest Firefox theme ever made. (Screenshot) It has it all: fake pink fur, leopard skin and a bling bling factor of about 12 (out of 10). Unfortunately though, it isn’t yet compatible with the soon-to-be Firefox 1.5. Can’t wait. Posted in Mozilla Firefox | Comments Off on PimpZilla – The Coolest Firefox Theme Ever? This, together with the setting to download and install updates automatically, makes it possible for me (and these other guys) to install Firefox for friends and other acquaintances without having to follow up with update installations. Firefox – Cool and Geeky? I just realized. Few things are as cool and geeky, at the same time, as Firefox is. Can anyone think of any other examples of things that are cool and geeky? Posted in Mozilla Firefox | Comments Off on Firefox – Cool and Geeky? 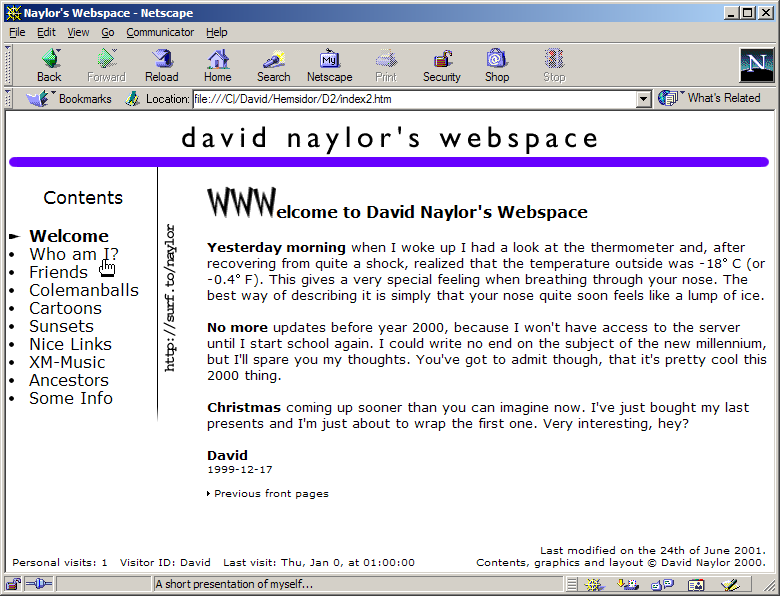 I guess it all started back in 1998 when we were to make our own websites at school. (I was 15 at the time.) To make them, we had Netscape Composer – version 4 if I remember correctly. Somehow I got hooked on this whole webpage making thing. I guess I had always enjoyed making nicely laid out documents with word processors, ever since I was a tiny kid. The ability to produce a dynamic document with colours really appealed to me, since any paper documents I made could only be printed on our (black and white) laser. Naturally, my first website was an incredible strain to the viewers eyes. What, with animated flags and spinning e-mail icons, frantically psychedelic backgrounds, and an over-all colour theme that made your stomach churn. This was presumably making up for all the years of black and white only. Sadly, I can’t seem to find a copy of the old gem. Maybe it’s for the best. Finally Netscape 6.0 was released (November 2000), but to pretty chilly reviews. Buggy and slow was the general verdict. If I remember correctly I waited until version 6.2 before I installed it on my dad’s computer. A year-and-a-half later (in June 2002) I read on browsers.com that Mozilla 1.0 had been released. I hadn’t heard much about Mozilla before this, so I was rather curious. 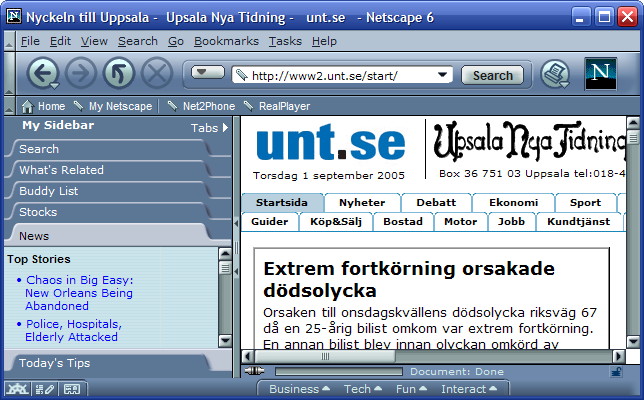 I learnt that this was what Netscape 6 had been built from. I liked the idea of always having the latest and greatest web browser, so I chose Mozilla over Netscape. Tabs, of course, made for love at first sight – a great feature for someone like me who liked surfing a lot. They were also very handy when on a dial-up modem, which I was at the time – just open the interesting pages in a bunch of new tabs and disconnect before you start reading them. By now I was definately a Mozilla addict. Why should I use anything else? Mozilla was the best. Or was it? MozillaZine was increasingly reporting about this Phoenix thing. At first I didn’t take too much notice. I had become used to the Mozilla Suite and felt comfortable using it. Then when Firebird 0.6 was released in May 2003, I gave it a try. There were some things I liked about it straight away, like the way it handled tabs (slightly differently compared to Mozilla Suite) and the separate search box. 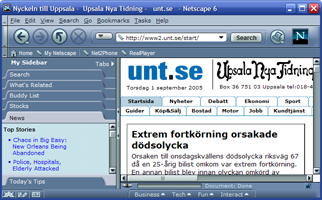 Other things that were added later on during the development, such as the Extension and Theme managers, were also very handy. At first I missed having all the managers which Mozilla Suite had: Cookie Manager, Popup Manager, Form Manager, Image Manager, Password Manager. You name it. (Did I hear someone say control freak?) Pretty soon though, I realized that all those Managers weren’t really necessary. Firebird showed that it was possible to get along without them, thanks to carefully chosen default values of the preferences and smarter handling of, for instance, passwords. Like most of us, I was pretty (positively) shocked and surprised when Firebird was renamed Firefox, at version 0.8, and given a new logo. They worked great together. Then, at version 0.9, the default (Windows) theme was changed too. While many people didn’t like the new theme, I always thought it was better than Qute (the previous theme), which I realized had some rather inconsistent icons. The new theme was more professional in style, and at the same time remaining colourful and XPish. Firefox was, by the final release, a great browser for almost everyone. I could (and still can, of course) install it on all my acquaintances computers, and they would hardly have any problems using it even though they hadn’t touched anything other than IE for what – like, 5 years? If ever. Firefox is (obviously) also loads of fun for the more advanced computer user who can install extensions to their hearts content, such as (my favourites) Adblock and Minimize to tray. There is an extension out there for every single purpose you can think of. Is there anything you can’t do with a Firefox extension? I was aware of Opera for quite some time – probably since around the time I first started keeping an eye on browsers.com. 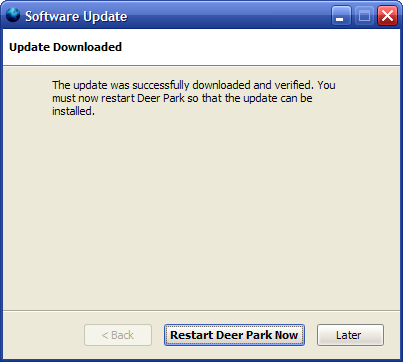 Since it was shareware, though, it didn’t really interest me. Opera released their first ad-supported version as early as December 2000 (version 5) but the banner put me off completely. (If I even tried it – I don’t remember.) It also had a somwhat awkward look, which I couldn’t quite get used to. The freeness, usability and, in fact, design of Mozilla Suite (and later Firefox), as well as their entirely open development process made me stay in the Mozilla camp. I have a vision (like many others, I’m sure) that Firefox (and possibly Opera, if they decide to set it free) will help open up the web for good, and make it equally digestable on all operating systems. This, in turn, will allow more people to give Linux a serious try (myself included). Once Linux gains a nice chunk of the market, it will be very difficult for Microsoft to win people back. The difficulty for people lies in the actual switching. Once that’s done, I imagine sticking with a free operating system won’t exactly be a neck-breaker… Obviously though, Microsoft failing is not the point here. The point of this vision is that more people could (and would) use a large proportion of free software, thus saving heaps of cash – at the same time putting some much needed consumer pressure on Microsoft. Mozilla Foundation announced yesterday that Mozilla Corporation has been created in order to simplify cashflow into the various Mozilla projects from other corporations. (MozillaZine has an article which explains the reorganization in an understandable way.) This sounds like good news to me. If the Mozilla Foundation has been earning cash at a rate which was problematic to it as a non-profit organization, that can’t not be a good thing. Hopefully, corporate interest in the Mozilla products will increase even further. Also, I hope we’ll see Firefox and Thunderbird bundled with new computers from one (or more) of the major PC manufacturers in the not so distant future. Maybe this move from the Mozilla Foundation was in order to allow or simplify such a deal? Who knows. I’m looking forward to seeing how IE7 will render my web gallery, which makes use of floats and fixed-position divs. I’m also very much looking forward to the day when we can make websites from scratch and see our CSS code just work in all the major browsers… And the following may sound strange coming for a Firefox addict and advocate, but I truly hope that Microsoft puts a huge marketing campaign behind IE7 once it has shipped so it as quickly as possible replaces IE6 (where still in use) on Windows XP. Firefox will have the older Windows versions for lunch, and through continuous innovation it will probably keep growing on the XP & Vista versions too. XiTi’s latest Firefox stats report shows that the best browser now has more than 10% in the US, Europe and Australia. (11.78%, 14.11% and 14.41% respectively.) It’s interesting to see that the less developed continents have a lower proportion of Firefox usage. One would almost expect the opposite. In Europe, Finland is still way ahead with 31%. Impressive. I wonder why Finland are so much better at adopting Firefox than for instance Sweden, their next-door neighbour? Here, Firefox is only about half as popular. Update (2005-08-22): The feature in question has now been named Clear Private Data , which is even better than Clear Tracks if you ask me. If you don’t know what the Greasemonkey extension is, check it out. …And another which enables scroll-wheel zooming for Google maps. The first one I find particularly useful – I have always found it annoying that you have to click twice when checking the results of Google’s image search. Firefox downloads would have continued at an unchanged rate if no-one had updated manually. Looking at the download graph, this assumption doesn’t seem completely unrealistic, since the dl rate was pretty stable from the beginning of December until 1.0.1 was released in late February. 1029 pixels were above the stable dl rate after 1.0.1 was released, and 2871 pixels can be considered legit downloads. This means that 26.4% or about 13,500,000 of the now 51,150,000 dls most likely were updates. That leaves 37,650,000 dls that basically can be considered “new people giving Firefox a try”. 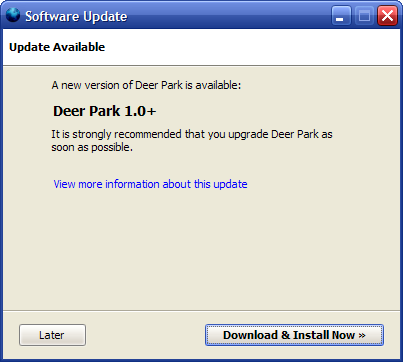 One of the main complaints about Firefox 1.0 has been that “you have to download the full installation when upgrading”. This has simply been due to the fact that Firefox had no system for such incremental patches. Well, it looks like Ben Goodger & co (Darin Fisher, specifically) have worked out a way to get incremental binary patching into Firefox for 1.1. Edit: Ben has also made some mockups of what the update manager will (should?) look like. If you haven’t yet tried the Abstract PC theme for Firefox, do so right away. It looks really professional and cool, both as in hot and low temperature. Firefox 1.1 Gets Lightning Fast Back & Forward? 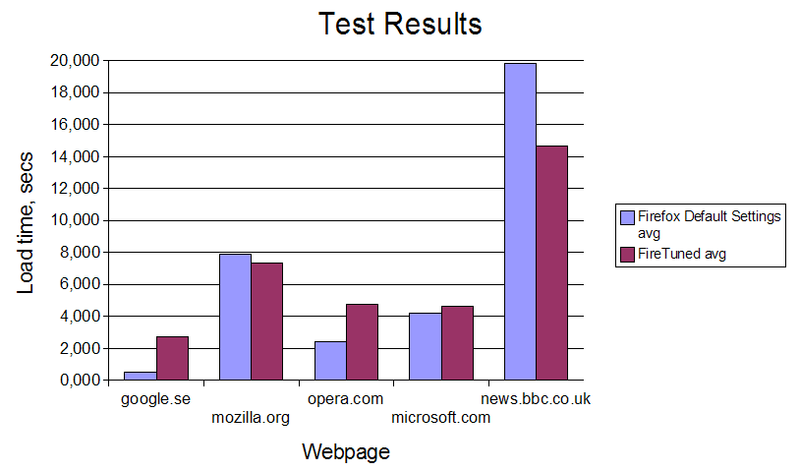 Opera has long had blazingly fast back and forward performance. Now it looks like we might get this in the upcoming v1.1 of Firefox too, judging from the amount of activity in bug 274784. Posted in Mozilla Firefox | Comments Off on Firefox 1.1 Gets Lightning Fast Back & Forward? Fascinating fact: (Well, sort-of) The soon-to-be 45,000,000 downloads of Firefox will equal about two-hunderd-and-fourteen and a half petabytes of data. Assuming that the downloads were evenly spread out, that equals a constant bitrate of 127 Mbps from the Mozilla mirrors put together. Putting it that way makes it sound less impressive. So I’ll just stick with the petabytes. Anyway. All of this downloads counting reminds me of how McDonalds in the US keep (or kept?) saying “We have now sold X godzillion hamburgers”. Still, counting is fun. The Acid2 test is already having impact on some of the main browsers. David Hyatt, who is one of the developers behind Mac’s Safari, has just blogged that he has already fixed two bugs which cause Safari to not display the test correctly. More bugfixes are on the way, too. The Mozilla browsers have also joined the party – an Acid2 bug has been created in their bugtracking system, which is meant to make up a list of all the rendering bugs which make Firefox et al fail the test. Let’s just hope these guys also decide to come and join the fun. The options dialog has been seriously improved and simplified. The Sanitize function has been added, making it possible to automatically sweep your tracks when exiting Firefox (or via a key-stroke). Finland turns out to have an even higher percentage of Firefox usage (22.6%) than Germany (21.6%), which was though to be the prime foothold for the Mozilla browser. No doubt, Stats Weenie will have an update on this report too in a little while. 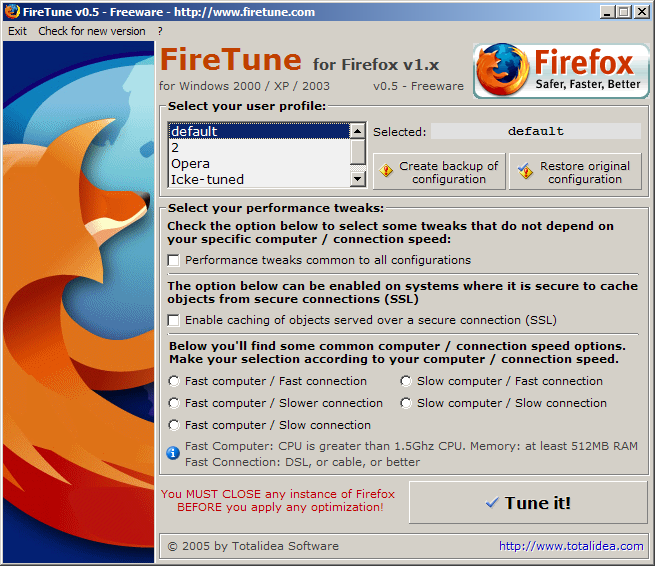 I recently heard of FireTune 0.5, a free tweaking utility for Firefox 1.0. I thought it would probably just activate pipelining, but I’d give it a try all the same. It turned out it didn’t touch the pipelining settings, but it altered the number of connections allowed per server (among other things, perhaps). It then lets you select roughly how fast your computer is, and what type of Internet connection you use. Since my computer is an AMD 64 3200+ and I’m on a 0.5 Mbps DSL connection I thought it suitable to choose “Fast computer / Fast connection”. I did the tests using the timer suggested by Total Idea, after inactivating both disk and memory cache before starting (by setting browser.cache.memory.enable and browser.cache.disk.enable to false) I set up two new, identical profiles: one which I tuned, and one which I left with the default Firefox settings. Each webpage in the test was loaded ten times with each profile and an average was calculated. Now, since I’m not an expert on Firefox’s network settings, I don’t quite understand why the tuned settings are causing longer load times for some of the webpages. If you do – let me know in the comments. 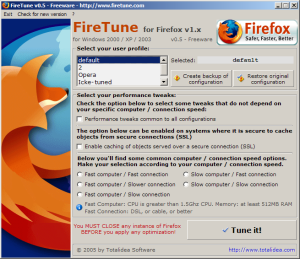 Posted in Mozilla Firefox | Comments Off on FireTune makes Firefox slower?